This level has medium difficulty. 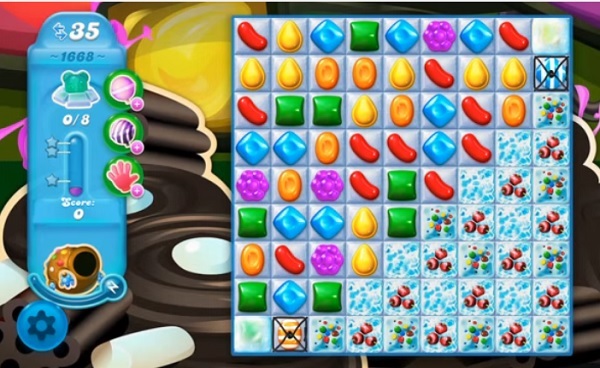 For this level try to play from bottom part of the board to shuffle the candies as it will help to get more chance to make special candy. Combine them with each other or play near to snow blockers to break them all. My board is set up the same but the blockers are not the same. They all need to be hit 4 times. Impossible with that many moves. I have been having all kinds of problems with candy crush soda lately. I guess it’s time to quit! Yes, me too. The Board looks the same but I have never had that many opportunities to make special candies. I have u used several of the power ups but never manage to clear the bulk of the board. Also thinking maybe it is time to say goodbye. Don’t have the amount of moves that I should have. Takes manny hits to clear blockers. Used boosters no help. Haven’t had the right board.